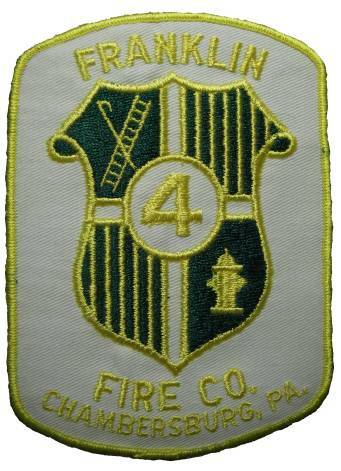 The first organized fire company in Pennsylvania was started in Philadelphia by Benjamin Franklin in the year 1777. 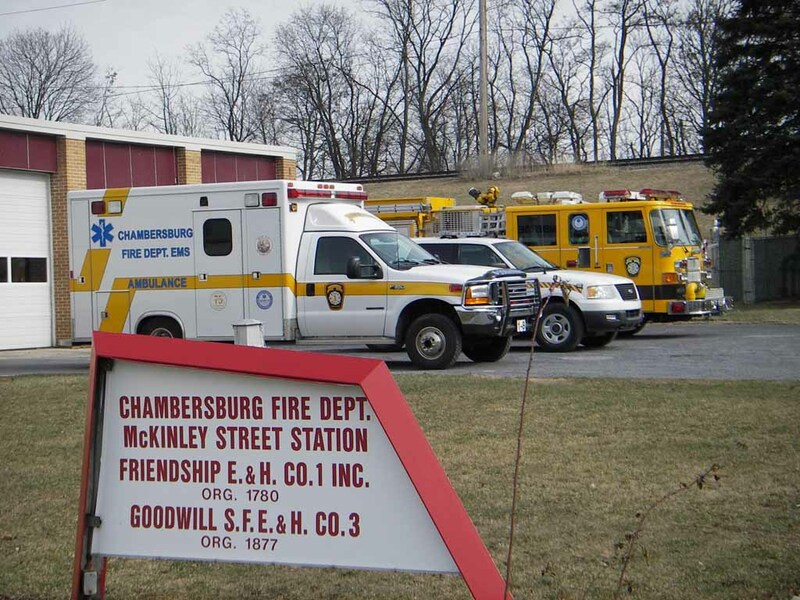 Therefore, the Friendship Company of Chambersburg has the honor of holding a place among the first of these organizations. 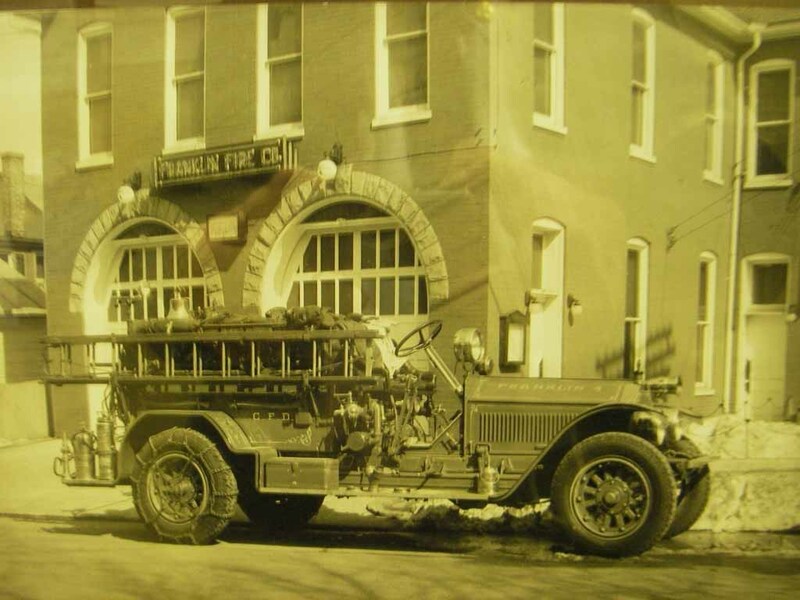 The Friendship Fire Company was organized March 31, 1780 under the name of the United Fire Company. In its early years it was known as a “bag” company, whereas each member had a double bag made of ticking. Firemen would run to the scene and fill the bags with articles of value which would be turned over to a committee appointed to care for them. Sometime later, the company was known as a “bucket brigade” whereas the firefighters used leather buckets to extinguish the fire by filling buckets at a source of water, passing the buckets by hand to one another standing in a line, throwing the water on the fire, then passing the buckets back to the water source to be refilled. What is interesting is that each household was given two leather buckets to assist with firefighting efforts. About 1800- Philip Berlin brought first hand engine from Lancaster by conestoga wagon. 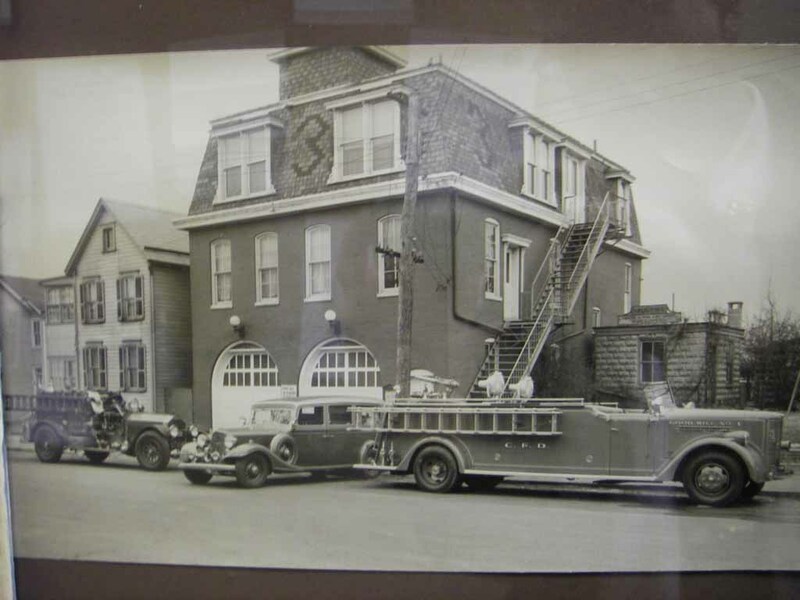 There is conflicting information as to the dates and locations of the early fire station, but from 1830 on it was situated on South Second Street in Friendship Hall, now police headquarters. 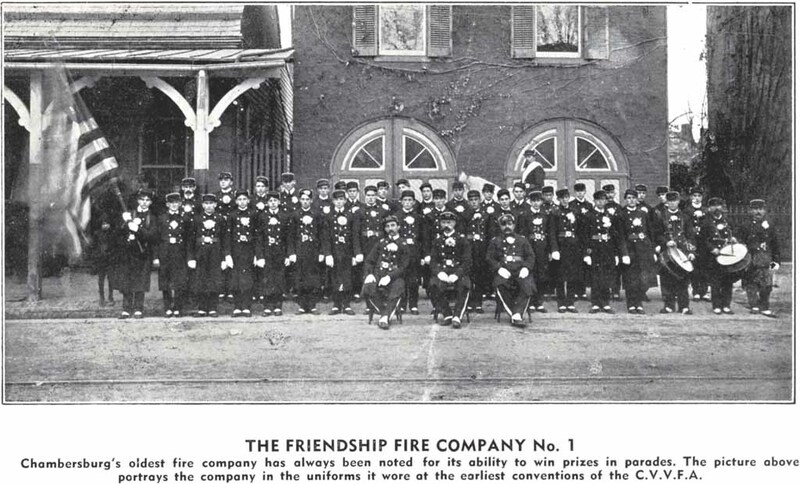 1901-Friendship Engine and Hose Co. No. 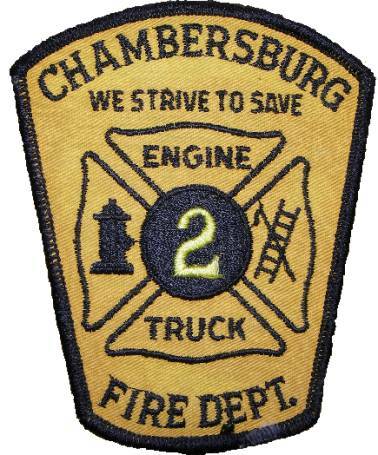 1 located in old Borough Hall, currently Chambersburg Police Department. Present day Borough Office/Chambersburg Police Department. Around 1818-1820 reference is made to a station located on South Main Street. During 1839, the engine house now occupied by the Court House Plaza was built. During the burning of Chambersburg, the Friendships did some effective work in saving Brown’s Hotel, now the Public Library (today the Northwest corner of South Second Street and East Queen Street) from destruction. As a result of hard work and well directed streams of water nothing but the roof of the hotel was burned. Of course, the building was drenched with water. Men and women worked together in their efforts to keep the flames from spreading across the street to the Masonic Hall, Methodist Church, and the Market House. 1911-station was located at the junction of Lincoln Way East and Queen Street. 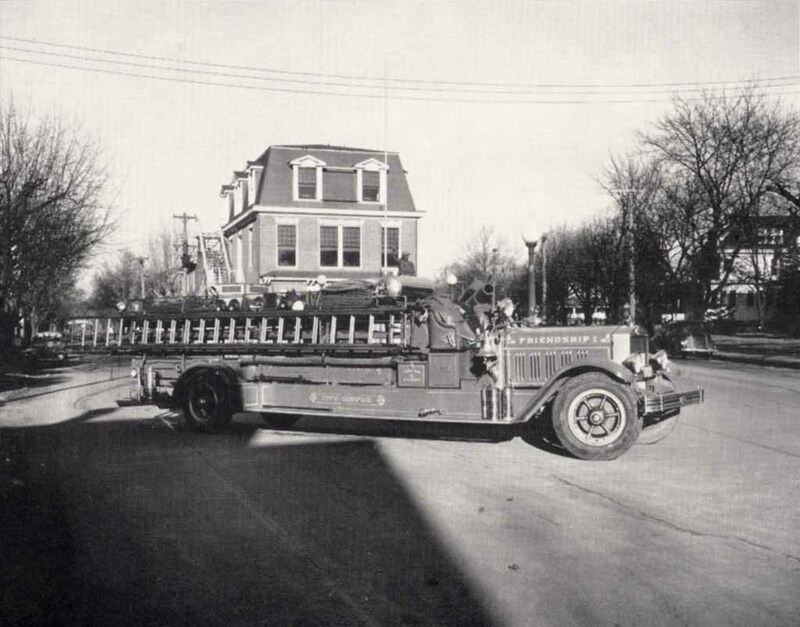 1930’s model American LaFrance City Service Truck. McKinley Street Fire Station – 261 East McKinley Street. 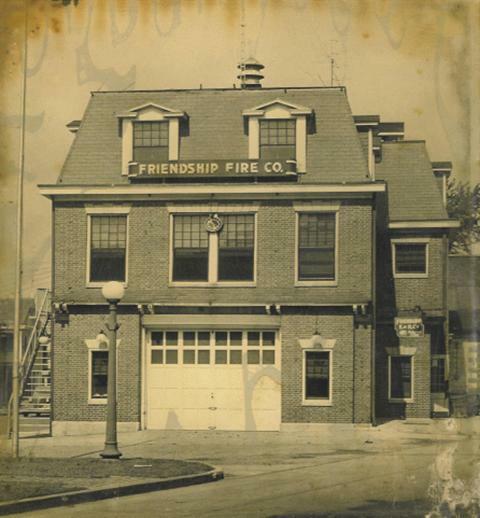 There is a discrepancy between the date of organization on the sign in front of McKinley St. Fire Station (1780) and the date the company has recorded of the earliest company records found in the Friendship’s 200th anniversary book (1794). November 1974—The company is approached with the idea of moving into the CV’s station on Broad Street until the new station is completed on North Second Street, at which time the Junior’s, CV’s, and Friendship’s would be housed in this new station. It was felt this move would not be in the best interest of the company or the community. The company would await another offer from the Borough and attempt to be located in the Good Will’s Station with separate facilities. April 1976—On the 6th of April, the final regular monthly meeting of the Friendship Engine and Hose Company No. 1 to be held at the station at East Point was called to order by the Vice President, Eugene Klee, at 8:00 p.m.
May 1976—The first regular meeting of the company in the new building is called to order by the President, Warren “Mike” Britton, on the 4th of May at 8:00 p.m. Originally called the “Friendship Juniors.” Recognized by Borough Council and organized June 13, 1872. 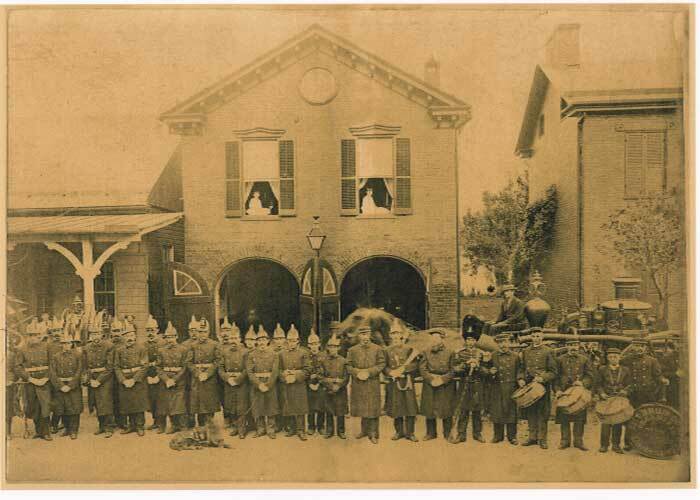 August 1, 1876 - Men interested in the formation of a new fire company met. 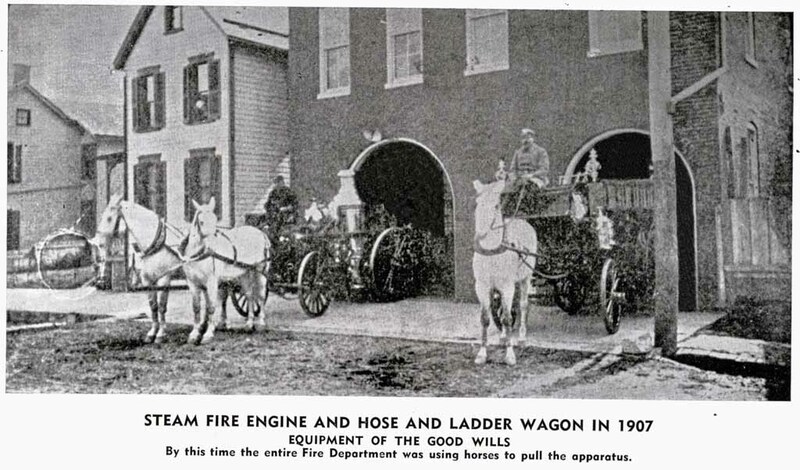 August 10, 1876 - The Hook and Ladder Company formed and adopted the name of Vigilant Hook and Ladder Company No. 1. The Vigilant Hook and Ladder Co. is housed on North Second Street opposite the present Junior House. 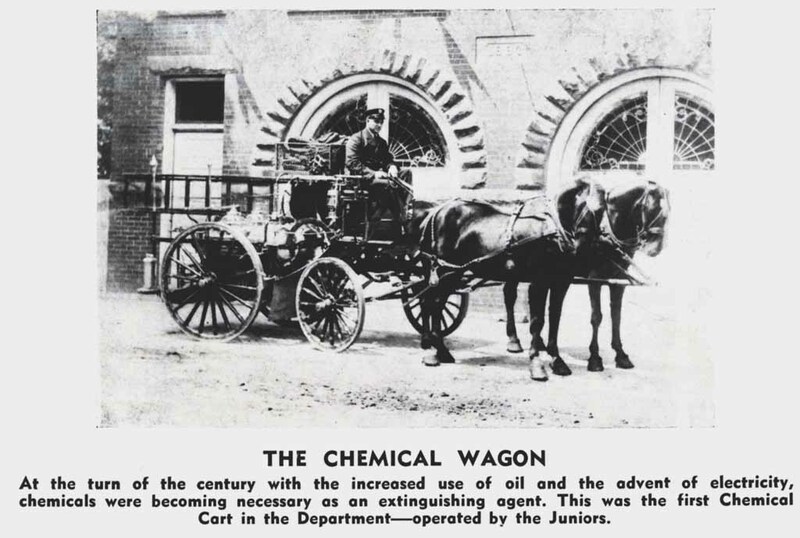 1903 Council purchased a chemical engine, the same drawn by that never-to-be-forgotten pair of black horses, Doc and Derby. Junior Hose & Truck Co. No. 2 Fire Station – North Second Street. Headquarters fire station 2010 – 130 North Second Street. Currently houses Junior Hose & Truck Co. No. 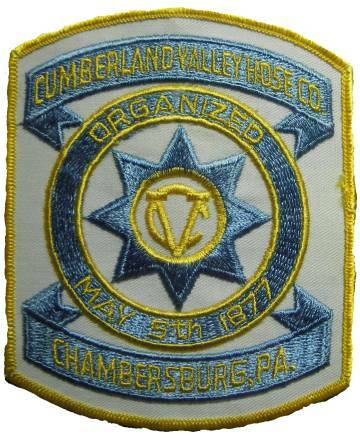 2 as well as the Cumberland Valley Hose Co. No. 5. May 30, 1877, Fire Marshal John C. Gerbig called a meeting of citizens of the Third Ward for the purpose of considering the organization of a fire company in that ward. The committee proposed the name of “Third Ward Hose Company”. August 1, 1877 first meeting was held and officers elected. The first station was located at the northwest corner of Black Alley and German Street (now Liberty Street). 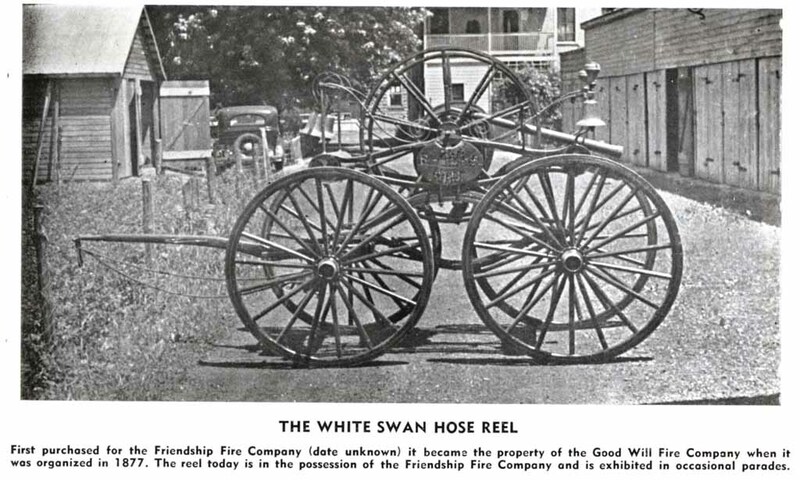 The first apparatus consisted of a hose reel pulled by hand, five hundred feet of hose, and was painted white with bronze trim and known by old members as the “White Swan”. November 1891 - a fair was held to raise funds to purchase a first-class steam fire engine. 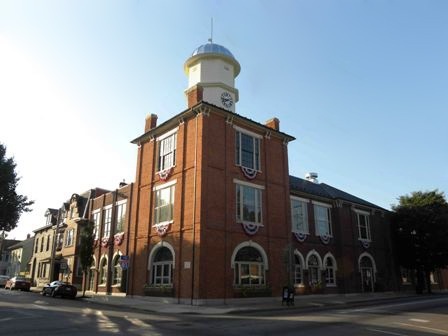 August 2, 1892 – A meeting was held with the Fire Marshal and a representative of Town Council. 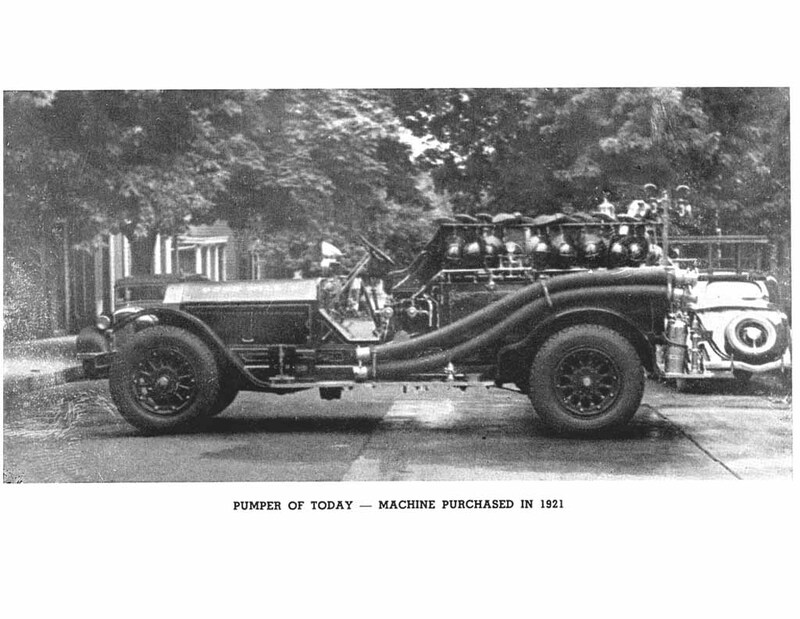 Result was that if the company would purchase 500 feet of hose, Town Council would purchase the steam fire engine. Accordingly, the hose was purchased as well as the steam fire engine. 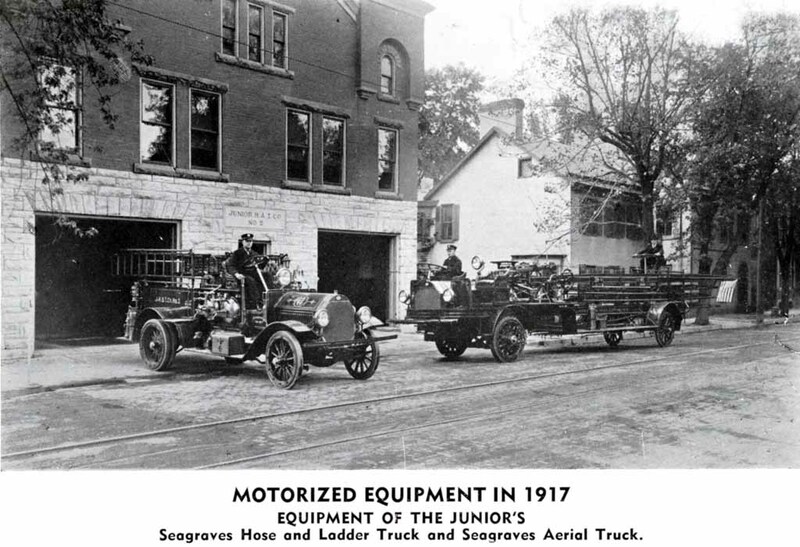 The steam fire engine was an American LaFrance and arrived on February 7, 1893 at a cost of $3,200.00 and placed in the Good Will Fire House. 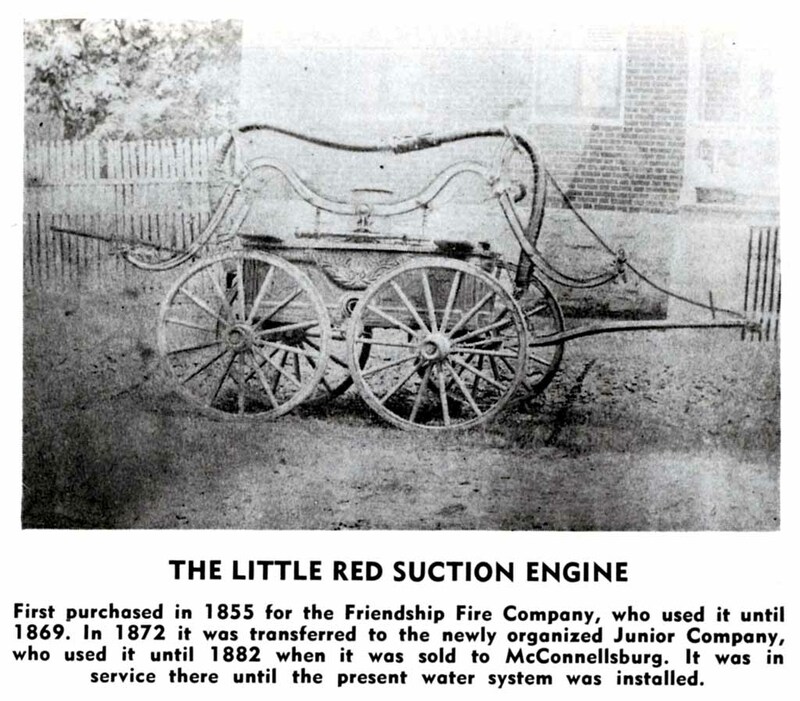 November 14, 1905 – Town Council at the request of the Good Will Fire Co. purchased a hose wagon to replace the old hose reel as it was in service since 1877 and had served its purpose. The hose reel was in service a total of 28 years. Good Will Fire Station located on East Catherine Street. 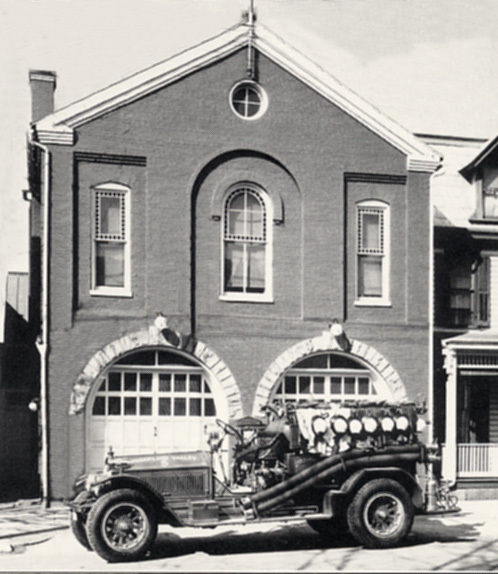 Franklin Street Fire station – North Franklin Street, owned by the Borough of Chambersburg. Franklin Fire Co. No. 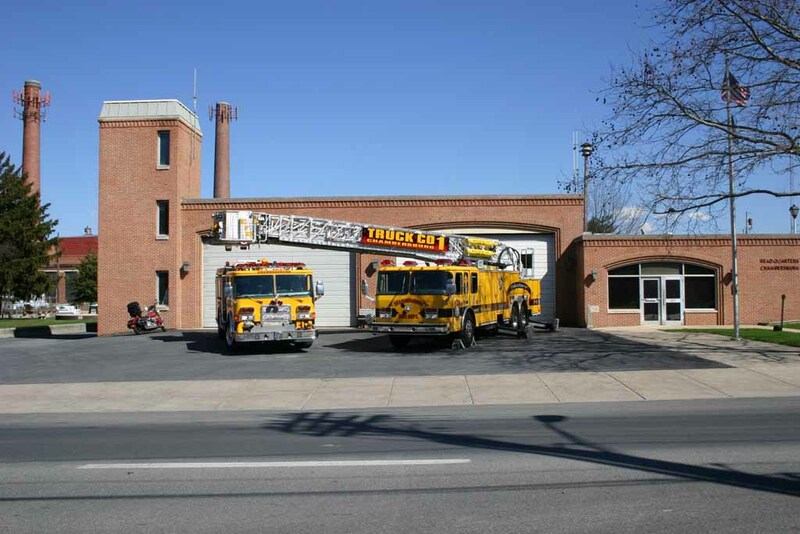 4 Fire Station – 158 West King Street, owned by the Franklin Fire Co.
Cumberland Valley Hose Co. St. Fire Station – Broad Street, owned by the Borough of Chambersburg.